United States. Morkies, also known as Yorktese, are a cross between a Yorkshire Terrier and a Maltese. It can be difficult to determine the size of a Morkie due to the fact that the offspring can take on characteristics from each breed involved. Generally Morkie's range in height between 6-15 inches and weigh between 5-15 pounds. Typically, the coat of the Morkie is silky, straight and fine. Usually the hair is long and comes in a variety of colors such as black, tan, white, a combination of each, sable, etc. The Morkie is a lively, spirited, intelligent and loving dog. The mix of Maltese and Yorkshire Terrier usually produces a lively, playful dog devoted to its family with a loving sweet nature. The Morkie loves to play or curl up on the couch for a nap and requires frequent human companionship. The Morkie is a lively, spirited, intelligent and loving dog. The mix of Maltese and Yorkshire Terrier usually produces a lively, playful dog devoted to its family with a loving sweet nature. The Morkie loves to play or curl up on the couch for a nap and requires frequent human companionship. The Morkie will do well with other dogs and non-canine pets that they have been raised with. If left alone too long, a Morkie may become bored and destructive along with incessant barking. They long for human companionship. The Morkie is suspicious of strangers and will alert the family to a stranger's presence as well as any sounds that appear out of the ordinary. You can find Morkie puppies priced from $200 USD to $2800 USD with one of our credible breeders. Browse through our breeder's listings and find your perfect puppy at the perfect price. The Morkie will do well with other dogs and non-canine pets that they have been raised with. If left alone too long, a Morkie may become bored and destructive along with incessant barking. They long for human companionship. The Morkie is suspicious of strangers and will alert the family to a stranger's presence as well as any sounds that appear out of the ordinary. The Morkie requires daily brushing to keep the hair from matting and tangling. Bathe when necessary and be sure to use a mild shampoo to avoid skin reactions. The Morkie should be socialized at an early age. Morkies can be a bit stubborn and require a gentle but firm and patient trainer. Special emphasis should be put on potty-training as some Morkies can be difficult to housebreak. A Morkie is well suited for apartment living as long as they are sufficiently exercised and have toys to play with. They enjoy family play time, walks and play time in a fenced yard. Morkie Puppies for Sale - Shipped Worldwide! Finding the right Morkie puppy can be dog gone hard work. PuppyFind® provides a convenient and efficient means of selecting and purchasing the perfect Morkie puppy (or Morkie puppies) from the comfort of your home, 24 hours a day, 7 days a week. 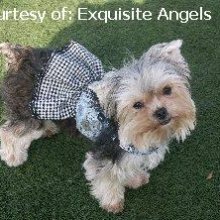 Take advantage of our PuppySearch or leisurely browse our directory of hundreds of dog breeds, Morkie dog breeders, Morkie dogs for adoption, and Morkie puppy for sale listings with photos and detailed descriptions. Some Morkie puppies for sale may be shipped Worldwide and include crate and veterinarian checkup. Many Morkie dog breeders with puppies for sale also offer a health guarantee. With thousands of Morkie puppies for sale and hundreds of Morkie dog breeders, you're sure to find the perfect Morkie puppy.